If you have special needs or a medical condition, it is even more vital to be prepared for anything. This can be an overwhelming task when you consider all of the things that you utilize and rely on daily. To ensure you don’t forget anything, consider compiling your own checklist, including all of the aids, equipment, and tools that you require to preserve your autonomy. From breathing issues to legal-blindness, physical limitations to hearing-loss, be prepared for whatever comes. Storms, evacuations, or natural disasters can force you from your home; are you ready? Do you use a walker, wheelchair, or scooter? Don’t get caught ill-prepared when an emergency strikes. Keep necessary aids and supplies at home, in the car, and on-the-ready, in case you need to evacuate your home swiftly. Put-together tire patch kits for wheelchairs and scooter and keep on-hand at all times, including in your vehicle, purse, or evacuation-bag. Invest in a lightweight transport chair, if feasible. It will make it much easier to transfer in a hurry. Don’t forget about supplies for service pets, if applicable. This includes vet records, any medications, extra food, and a cache of water. 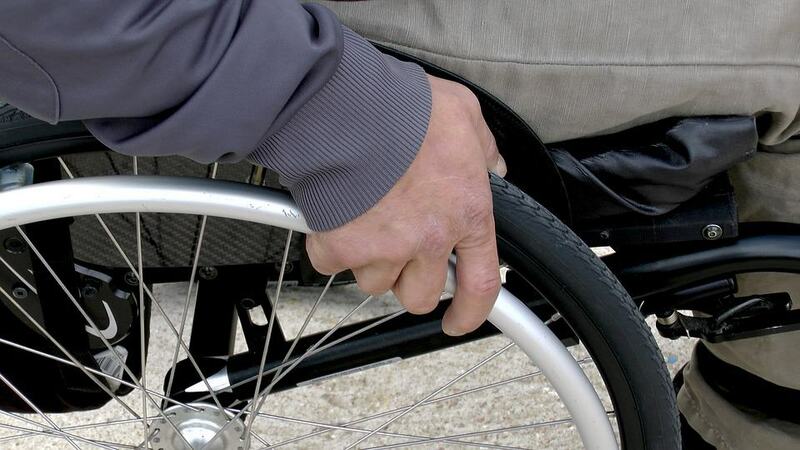 Keep your wheelchair secured near the bed for easy access in an emergency. Stow spare eye-drops or medications prescribed for conditions such as glaucoma on-hand. Again, make sure you have adequate supplies for your service dog, if applicable. Tuck a spare pair of eyeglasses or magnifiers in your preparedness kit. Use fluorescent tape to label your emergency supplies for easier identification when needed. Masks and respiratory aids should always be carried with you, as well as in any preparedness kit. Keep oxygen tanks charged and secured to the wall to prevent accidents later, like during an earthquake or other jarring natural disaster. Talk to your providers about portable oxygen tanks that will make it easier if you have to ‘bug-out’ of your home. Buy a weather radio with a visual display to know when you will need to evacuate – as well as when you can return home. Keep a signaling device on-hand and nearby, like an air-horn or bell, for attention during an emergency. Use labels on emergency supplies and reservoirs for others to easily identify; ask case managers about labels to help with this. Make sure that you keep a laptop charger for the automobile if you rely on your computer for texting to communicate with others. Get one that will plug-in to your car’s cigarette lighter. There are some other basic supplies and tools that The Red Cross suggests every individual keeps on-hand for emergency situations and ‘bug-outs’. If you do find yourself being evacuated, make sure to secure your home and take the keys with you. Health information, prescriptions, and related-documentation. Contact information for loved ones, caregivers, and providers. Food reserves and water for yourself and your pets too. A pair of work gloves and extra apparel. Reflective vest and rain ponchos for the car. A basic tool kit to keep in the vehicles, including booster cables and road flares, ideally. Maps, since it is possible you won’t have GPS or internet connectivity. Plastic bags, which serve a variety of purposes in an emergency. How prepared are you for an emergency that drives you from your home? Talk to the experts at Pacific Mobility about aids and devices that will travel with you – and that will help you become more prepared and comfortable during a crisis.